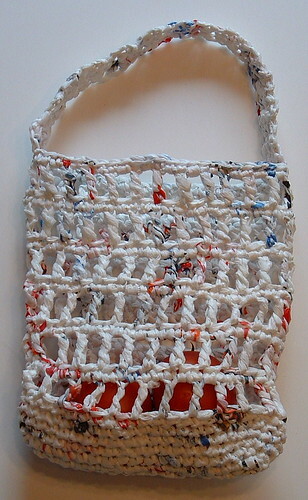 This week’s recycled bag project is a crocheted plarn produce bag. I have had a reusable produce bag on my to-do list for some time now. And thanks to a request from a reader of my site, I was encouraged to finally get it done. Here is my plarn making picture tutorial to help you get started. 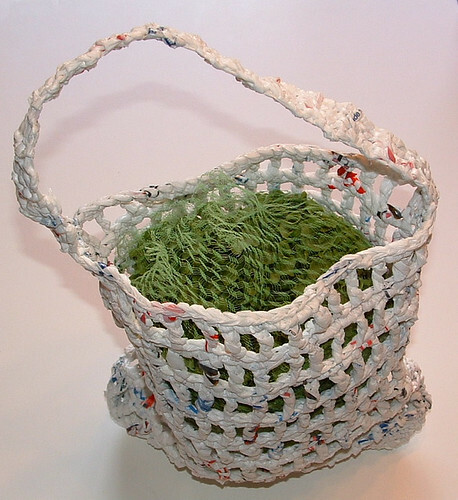 Crafting with recycled plastic bags is fun, frugal and a great way to recycle plastic bags into something new and useful like this reusable produce bag. 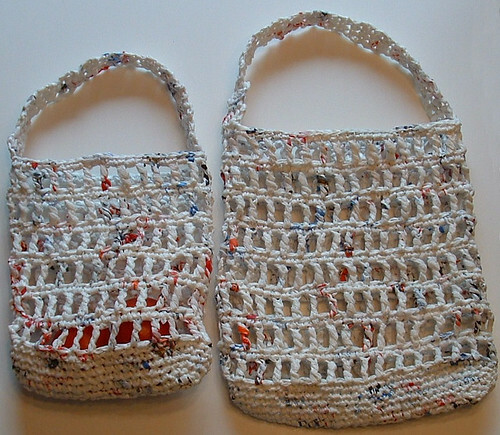 Directions are given for the smaller produce bag and then options for the larger bag given at the bottom of the pattern. If you are a frequent reader of my blog, you know that I often make things that I need rather than purchase them. I so enjoy creating something to fill a need I have. Well, my dog has been having these issues of licking her forelegs and they were getting very sore. There is nothing wrong but it’s just a bad habit of her’s to lick her legs. I tried putting some socks up on her legs to prevent her from licking but that didn’t work very well. 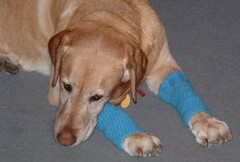 Here is a closeup of the dog legging I crocheted. My dog’s foot is about 7 inches around at her paws. I tried to make the leggings loose enough to fit over her paws but tight enough to stay up once on her legs. I found if you roll them up a bit it’s easier to get them on over her claws and up on her legs. They stay on pretty good but she did manage to lose one outside in the snow but I found it. So just a word of caution, they do stretch out so make sure you make them tight to begin with so they stay on. I usually just make her wear them in the house now so we don’t lose them outside. With Valentine’s Day just around the corner, I thought it might be fun to share some Valentine themed craft projects that I have been working on. 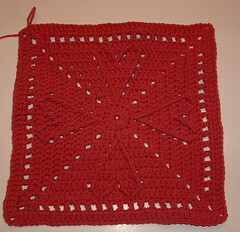 Last month I participated in a cabled heart crochet along and here are the two heart squares I made. 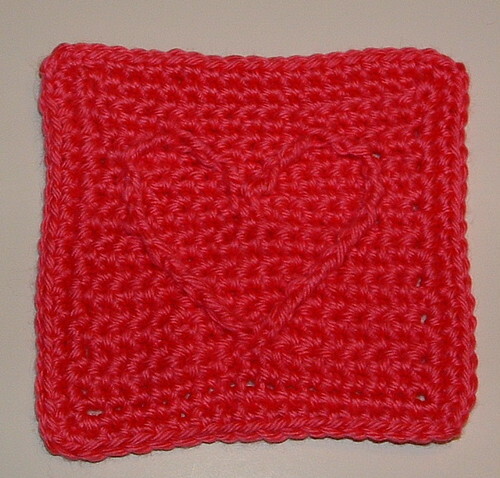 The 12 inch crocheted cabled hearts square features 4 hearts. 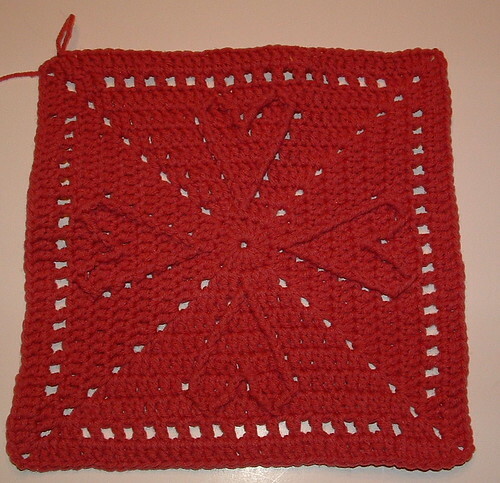 This 6 inch cabled heart square pattern features just a single heart. I just loved the 12 inch Yarncrazy Cabled Hearts Pattern (not available anymore) and thought it would make a wonderful center for a crocheted baby blanket. 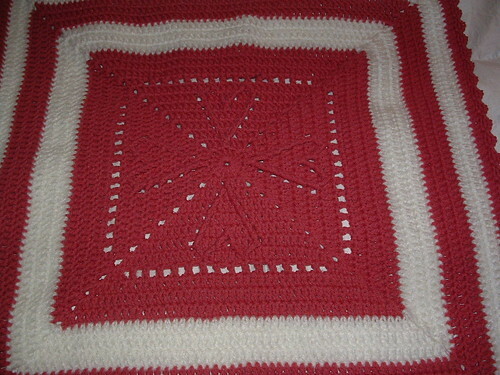 So I used the large square and then proceeded to double crochet around it to create this baby afghan. Here is my latest free crochet pattern. I call this dishcloth Many Scalloped Boxes. 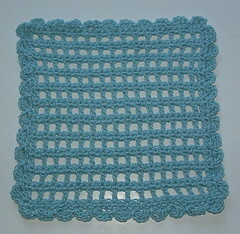 This dishcloth pattern is a variation of my open mesh magic dishcloth pattern. 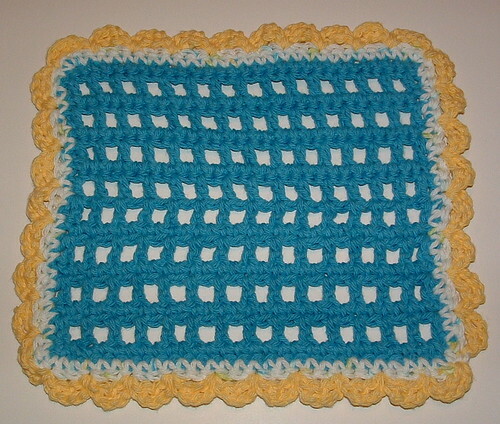 It’s worked with a sport weight cotton yarn and features a scalloped edging. 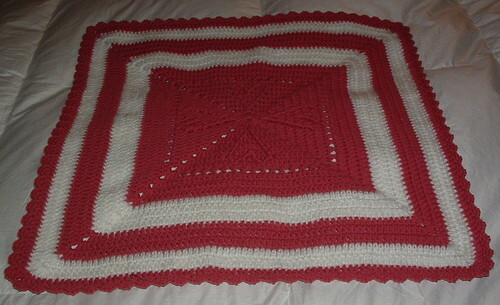 Here is another one worked in regular weight cotton. 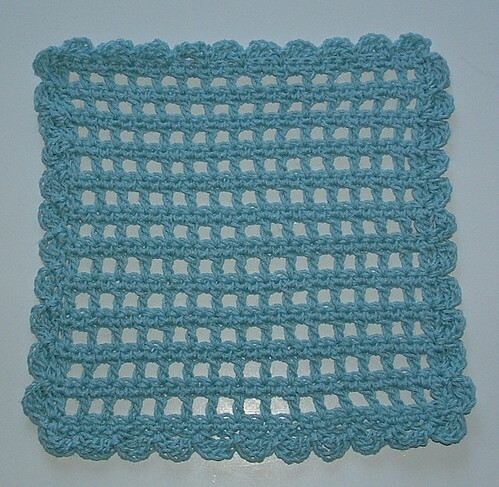 If you like a more open-stitched lightweight dishcloth, you will enjoy using this crocheted dishcloth. It dries out quickly while still providing an excellent cleaning cloth.